If you like to take things that are perfectly simple and then over-complicate them to the point of ridiculousness, then this is the fruit for you! The taste of this banana is really good but I literally had to wait two and a half weeks for it to soften to the point of being edible. Even then it was ridiculously soft with a weird core, which is not something I am used to in a banana. In its firm state you can cook it up like a plantain but I did not try this because I am a simple girl and just a wee bit lazy. I like fruit for many reasons, one of the main ones being that it is a dessert that I can just eat. Immediately. No fuss. No muss. Bananas generally are, and should be, the king of this. You don’t even have to wash them! Bananas grow on the tree with the stem end at the bottom and the fingers pointing up – exactly the opposite of what those cute little banana holders would lead us to believe. Don’t be fooled by that kind of backward thinking, banana hanging propaganda. Bananas need to stand at attention in order to grow, despite their marketing efforts to the contrary. Stop trying to be lazy bananas! That is my job. These are best eaten baked, boiled or fried. 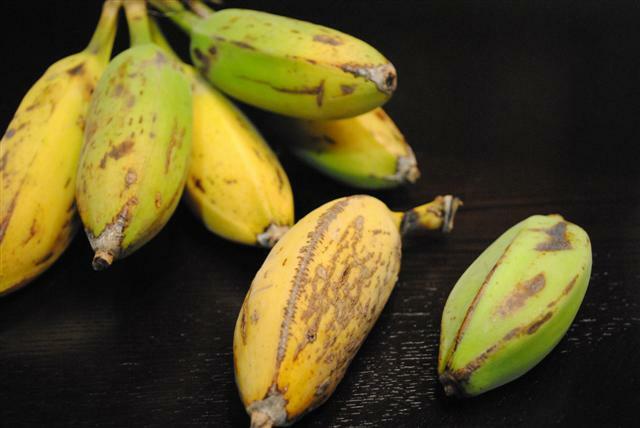 Fully ripe with slightly black skin makes for good fried plantains. Hmm. I didn’t think these were plaintains. Perhaps you are right on cooking them though.